The release of the Alice in Chains album The Devil Put Dinosaurs Here. The “Stone” video features (among other things) a guy rolling a giant rock up a hill, only to have it roll all the way down, after which he starts over again. This image is taken right from one of Camus’ most famous works, The Myth of Sisyphus (1942). Or, to be fair, the story itself is taken from Greek mythology, in which the gods punish Sisyphus (the details of his crime are irrelevant) by condemning him to roll a giant rock up a mountain only to have the rock roll down again every time. Camus puts an existentialist spin on the story: Sisyphus is not the kind of guy who, realizing the futility of the task he has been given, despairs and kills himself. Instead, he takes on the task as something he does, a part of who he is and what his life is, in a simultaneous act of acceptance—of the task—and defiance— against the gods who thought they could punish him via the task. Those words seem to come directly from an actual drug user, i.e. Staley himself. Later lyrics, such as “Your Decision” from Black Gives Way to Blue, discuss the user seen from an outsider’s perspective, yet with acceptance of his decision to follow the path he has taken. Alice in Chains songs also tell stories such as that of the Vietnam veteran in “Rooster” (based on Jerry Cantrell’s father) from Dirt, the chorus of which echoes the defiant resilience of Sisyphus, as Staley bellows “You know he ain’t gonna die / No, no, no, no, ya know he ain’t gonna die.” “Rooster” and the junkie-related songs tell stories about individuals who try to make sense of the world around them by creating a sense of order and purpose in their life. If we look to—or rather, listen to—Alice in Chains’ music itself, we find an interesting parallel: Although the songs often have steady, heavy beats and catchy, blunt riffs, the guitar chord work and general soundscape typically have a loose, chaotic feel to them. To simplify matters a bit, the band sounds as if they are trying to tame chaos, or, if you’ll excuse a bad pun, “dam that river.” Indeed, this is the way the band works. According to the cover notes in the compilation box set Music Bank (1999), the song “Frogs” from the band’s self-titled album (1995) was composed around a recording of the frogs right outside Alice in Chains’ rehearsal space (if you listen closely, you can still here the frog sample in the background on the song). Also, in a recent interview Jerry Cantrell described his process of gathering ideas for songs as “like walking on the beach and picking up cool stones.” Later the band looks at the gathered material and starts working from there. Alice in Chains thus take an existentialist stance in making music, a stance not far removed from Camus’ thoughts on life: The world may be chaotic and without meaning in itself, but we as humans put meaning into it by adding structure to the chaos. 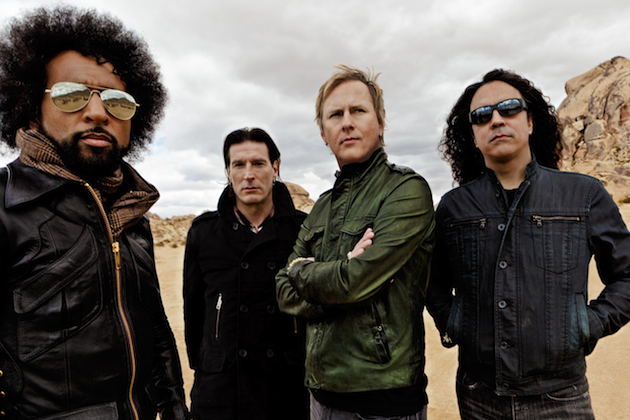 Alice in Chains’ lyrics typically focus on individuals and their choices in life, but the band’s lyrics have also dealt with cultural and political topics. For instance, the title track of the new album The Devil Put Dinosaurs Here criticizes the extreme Christian right wing, its creationism and condemnation of homosexuality (the chorus running “The devil put dinosaurs here / Jesus don’t like a queer / The devil put dinosaurs here / No problem with faith, just fear”). And if we go back to the beginning of Alice in Chains’ career, the song “Man in the Box” from Facelift discusses, from first-person perspective, what it’s like to live your life in a cage, inspired by a conversation the band had with a group of vegetarians who explained how the calves from which we get veal are raised in small boxes. The finished lyrics go beyond animal ethics, but the video, with Layne Staley sitting in a stable with other animals in booths right next to him, seems to underline the original departure point of the song. Søren R. Frimodt-Møller is Assistant Professor at Aalborg University Esbjerg, Department of Architecture, Design and Media Technology, and is also the Managing Editor of JMM: The Journal of Music and Meaning. He holds a PhD in philosophy from University of Southern Denmark, specializing in cross-disciplinary music research, but also has an academic background in visual communication. I’ve been looking high and low for some type of lyrical analysis of Alice in Chains’ lyrics beyond SongMeanings. Thank you SO much for this insightful and enticing read, and I look forward to checking out the rest of the site!